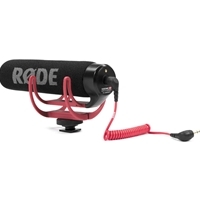 Rode VideoMic Go - On Camera Lightweight Video Microphone - Clear, directional audio on the GO! The VideoMic GO is compatible with the Nikon D4, D800, D600, D7100, D5200, D5100, D3200, Coolpix A, P7800, Nikon1 V2. It is also compatible with the Canon T4i, T5i, 60D, 70D, 6D and 5D Mk III. It is not compatible with the Nikon D7000, and Canon T2i, T3, T3i 7D and 5D Mk II.